Quebec's Liberal government continues to boast fiscal discipline in its battle against the province's looming debt. Quebec’s Liberal government continues to boast fiscal discipline in its battle against the province’s looming debt, tabling a $70.1 billion budget that restricts program spending and gambles on natural resource equities. Finance Minister Raymond Bachand tabled his third budget on Tuesday at the national assembly, vowing that Quebec will balance its ledger book within two years if it stays the course. "The proof is in the pudding, we’ve been doing it for the last two years, our spending is under control," the finance minister said. Quebec will cap its spending increases at two per cent - with health care accounting for half of program costs. The budget also provides a blueprint for natural resource development via a new, state-owned investment arm, Ressources Quebec. In a Quebec first, it will stake out equity shares in natural resource extraction to generate future revenues. That, along with increases in mining royalties, will allow Quebec to afford its public programs, and maintain its quality of life that "is the envy of most peoples in the world," Bachand said. "Maintaining this situation depends on the ability of the government to provide sustainable funding for these public policies and social programs." But Quebecers won’t be saddled with any new tax hikes, or unforeseen user fees to underwrite costs. "We are not asking more" of taxpayers, Bachand said. "I think the taxpayer pays his fair share of taxes and their burden is sufficient." The Parti Québécois qualified the budget as a grab bag of small measures to induce amnesia about past tax and fee hikes, and what it calls "Draconian" policies including tuition increases. The Liberals’ approach to natural resources and mining revenues is too "timid", accused PQ finance critic Nicolas Marceau. "It doesn’t have the courage of Australia, where they tax excess profits." Francois Legault, leader of the Coalition Avenir Quebec, called out the "major problem" with the Liberal budget. "The elephant in the room is the debt and the cost of the debt," said the former PQ finance critic. "It’s unfair for the next generation. We are using the credit card of our children." Financial analyst Marie-Soleil Tremblay calls Ressources Quebec an "entrepreneurial" program. « If you look at us in a North American context, we are very taxed. We can't go much higher, there is very little maneuver room. So it shows some sense of entrepreneurship, to go get that kind of revenue," said Tremblay, who is based in Quebec City. "There are risks involved - we could be spending a lot of money and not getting our worth in the end. But in 20 years, if we reduce our debt and continue to pay for our programs, people will say it's the most intelligent thing we've ever done." 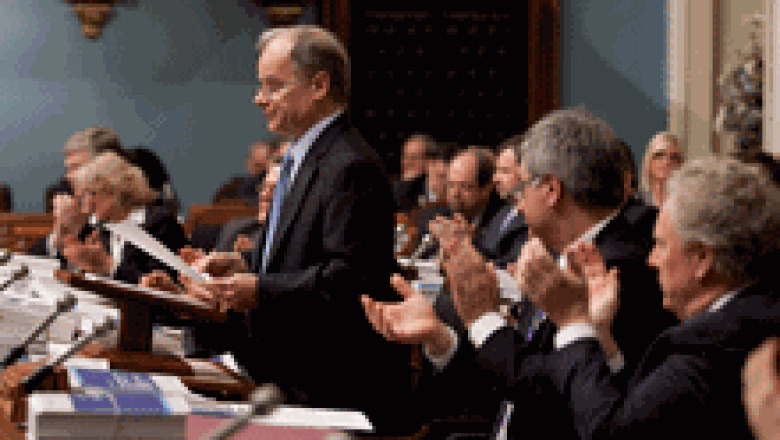 Finance Minister Raymond Bachand, left, during his budget speech Tuesday. (Canadian Press/Jacques Boissinot)Bachand said there is no turning back on tuition hikes, despite escalating student protests across the province. The Liberal government has repeatedly said it won't renege on previously-announced tuition increases ($1600 over five years). Bachand stressed the hikes, announced in March 2010, were followed by meetings and consultations. "Is it not reasonable for a university student to absorb part of the cost of his or her education? he asked. "I'm sorry they didn't participate more actively during the consultation period," he added, noting that 50,000 students across the province benefit from bursaries. The government's response is a cop-out, according to Léo Bureau-Blouin, president of the Quebec CÉGEP Federation. "What people must remember is that 80 per cent of university students are not eligible for the bursaries program. They have loans, but they have no bursaries." Middle-class families "are not eligible" for most Quebec bursaries, Bureau-Blouin said. The budget includes no new user fees - although previously introduced indexed fees will go up in 2012, including a health service fee, scheduled to rise to $200 in July of this year. Quebec also plans its own carbon market by 2015, to trade CO2 emission credits. California is the only other jurisdiction in North America with its own carbon market. "Basically what we’re addressing is increasing needs and our aging population. Given our limited spending, I think it’s significant," said Bachand. Tuition fees are due to rise in Sept. by $325, and will increase by the same amount annually for the next three years, despite escalating student protests in recent months. The budget also includes new tax breaks for seniors who want to work past 65, and people who care for the elderly in their homes. A voluntary registered savings plan (VRSP) will be available for employees who work in small and medium Quebec businesses. Montreal’s "darling" tourism sector will get $375 million to bolster activities around the city’s 375th anniversary.